Is this the best MoMA can do for Abstract Expressionism? 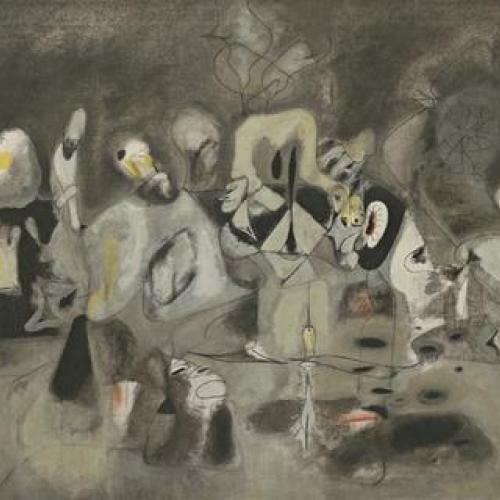 Even the best works—Gorky’s misty, labyrinthine Diary of a Seducer, the muscular chamber music of de Kooning’s black-and-white Painting, and Hofmann’s ecstaticCathedral—look intellectually moribund. That is the curator’s fault. She has arranged these supremely idiosyncratic inventions as if they were nothing more than hot properties at an auction preview. Everything ends up feeling generic. For all I know, “Abstract Expressionist New York” will generate big office for MoMA. After all, last summer’s “Picasso in the Metropolitan Museum of Art,” another in-house affair and one of the worst installed shows I have ever seen in a major museum, attracted over 700,000 visitors, becoming the biggest attraction at the Metropolitan since 2001. 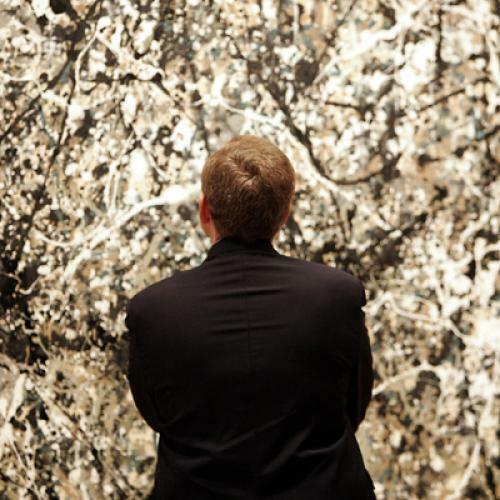 Foreign tourists—who are now MoMA’s target audience, replacing the hometown team of artists and sundry culturati who once made the museum great—are naturally eager to see such MoMA treasures as Newman’s vehemently rhapsodic Vir Heroicus Sublimis and Pollock’s autumnal One: Number 31, 1950. But even foreigners who are making their first visit to MoMA deserve something better than this presentation in which we are offered not paintings but MoMA logos. De Kooning’s Woman I looks demystified, defanged. She doesn’t howl now—she tweets. What is terrific about the relatively modest installations downstairs is the fluidity with which the curators, Jodi Hauptman and Sarah Suzuki, juxtapose more and less familiar works to generate fresh (and in some instances even quirky) insights and associations. You have challenging, calligraphic lithographs and drawings by David Smith, that titan of American sculpture, but you also have the architect Frederick Kiesler’s rough-hewn yet elegant and eloquent wood and rope Totem for All Religions. All through these galleries you sense invigorating confrontations between modernist dreams and urban realities, the clash of mythic hopes and quotidian experiences that gave art in midcentury New York its matter-of-fact grandiosity. Do not miss the cut paper compositions and stoneware sculpture by Isamu Noguchi, at once biomorphic and geometric, sleek and elemental; the chiaroscuro depths of Stanley William Hayter’s perfervid engravings, with their agitated figurations that probably influenced Pollock; and the pellucid elegance of photographs of the city by Rudy Burckhardt, presented along with a poem by his good friend Edwin Denby, that still underappreciated panegyrist of what he called “the climate of New York.” It’s a shame that the work of Burckhardt and Denby—who were close to de Kooning in the 1930s, sharing walks through the late-night city during which the painter came to his great realization that “content is a glimpse”—could not have been related to the de Koonings on the fourth floor. It’s also a shame that no place was found in this exhibition for a copy of Denby’s first book of poems, In Public, In Private (1948), which has as its frontispiece a bewildering drawing by de Kooning, a pattern of hexagons that suggest some sort of tile floor, but rubbed and smeared, as if by restless fingers, an image of quiet disquietude reflecting the uneasiness of the immediate postwar years. By the end of the 1930s, with Europe at war, the evangelism of the avant-garde, born a century earlier, had made its final leap across the Atlantic and reignited in the city that never sleeps. Hauptman and Suzuki make you feel the pressure of those times, the bewildering crosscurrents of a period when, as de Kooning once suggested, each artist was best off becoming a movement unto himself. It was a time that could accommodate the swaggering empiricism of Louise Nevelson’s earliest, most powerful found-wood constructions and the shimmering idealism of Richard Lippold’s Variation Number 7: Full Moon, with its spiderweb geometries. What is missing on the fourth floor at MoMA is precisely the yeasty, unpredictable mix of forces that in Manhattan defined the last stand of the avant-garde, the last moment when an artist, sitting alone in a studio, could believe that the tidal sweep of history had brought art to this point, that all the grand philosophical ideas, the dreams of Plato, Hegel, Kierkegaard, and Nietzsche, were with the artists, pushing them forward. “Ideas were in the air”: so did the philosopher Lionel Abel, who was a friend of so many of the painters, recall the atmosphere at the Cedar Tavern and the Club, the place where everybody gathered on a weekly basis to talk, which in those fearless days generally meant to argue. Temkin trots out the usual war horses, but she is unable to get the ideas moving, or to show how the paintings embody those ideas. I wish she had worked a little more thematically, perhaps drawing together a group of works to emphasize the streetwise lyric poetry of New York, the dark pastoral mood that you find in some of the late Gorkys, in de Kooning’s saturnine Valentine, and in Pollock’s Full Fathom Five (which I much prefer to the slightly later, larger drip paintings). 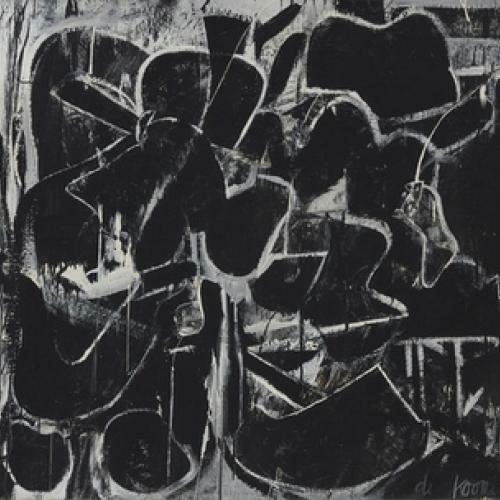 We see Pollock and de Kooning, in their mature work, reconnecting with the figure, yet beyond including Larry Rivers’s wanly unconvincingWashington Crossing the Delaware (a MoMA chestnut, and a rotten one at that), Temkin refuses to press on the question of the place of the figure within Abstract Expressionism, which would take her directly to de Kooning’s good friend Fairfield Porter, among others. Nell Blaine, who plunged into a painterly realism in the 1950s, gets into the show, but just barely, with an abstract linoleum cut from a book of poems by Kenneth Koch. Instead, you leave the Abstract Expressionists on the fourth floor and walk straight into a room full of Pop Art bearing the title “On to Pop,” a conceit so jejune that the curators seem to be sneering at the seriousness with which the Abstract Expressionists approached matters of form and content. Temkin also perpetuates the most blandly conventional ideas about the place of anti-Expressionist paint handling within the Ab Ex world, including the hard-edged work of Newman and Reinhardt, but making the usual mistake of overlooking a figure such as Burgoyne Diller, whose muscular geometric painting would look terrific in the context. This exhibition would probably have been the right place to make the case for Joan Mitchell as one of the very greatest painters of the period, right up there with de Kooning and Pollock, but although Mitchell is present, she’s not highlighted, certainly not enough. Temkin seems bored with the material. I am not suggesting that she should have mixed things up more, but I do wish she had found a way to be true to the crazy-quilt multiplicity of the art world that grew below Fourteenth Street in those years and can never really be encapsulated in a term such as Abstract Expressionism. The visual austerity of Reinhardt and Newman always fit uneasily with such a label. Clement Greenberg, recognizing the problem, preferred to talk about “’American-Type’ Painting.” Maybe “The New York School” was the best term to encompass this bunch of artists who made up what may well be the unruliest school the world has ever known. In the Mad-Hatter’s-tea-party talk at the Club, it was generally difficult to know what people were getting at and where the conversation was going. Such confusions were inherent in the struggle to establish what Harold Rosenberg called “The Tradition of the New.” The conversations continued on street corners and flowed into the bars and simmered all night in cold-water flats. It was through the talking and the painting and everything else that the artists did that New York found its place in the story of art. Some said that New York was a Byzantine city, by which they meant a city of mixings and juxtapositions, where people from many different places came together without ever losing their individuality. In New York your individuality was only cast in higher relief. To understand the city you must accept its mercurial intellectual and emotional weather. I know from experience, as I spent more than a decade writing a book—New Art City: Manhattan at Mid-Century—which takes in the studios and the streets, the artists and the audiences, the galleries and the museums, the ideas that had arrived from Europe and were transformed beneath the strong, clear light of this most modern metropolis. In parts of “Abstract Expressionist New York,” the galleries on the second and third floors, I recognize aspects of a New York that was coming of age as the artists were coming of age, a city that was inviting, estranging, discombobulating. As for the fourth floor galleries at the Museum of Modern Art, they present a sanitized version of mid-century Manhattan—a simulacrum of Abstract Expressionist New York that fits all too well in a museum that in so many respects has become a simulacrum of itself.